(CNN) – Rep. Michele Bachmann's former chief of staff doesn't think the newly declared presidential candidate is ready for the White House, but he issued an endorsement of Tim Pawlenty Tuesday. In an op-ed in the Des Moines Register, Ron Carey said the Minnesota representative lacks "the judgment, the demeanor, and the readiness" of former Minnesota Gov. Pawlenty. Carey, the former chairman of the Minnesota Republican Party, resigned as Bachmann's chief of staff in July 2010 and said that experience led him to now back Pawlenty. 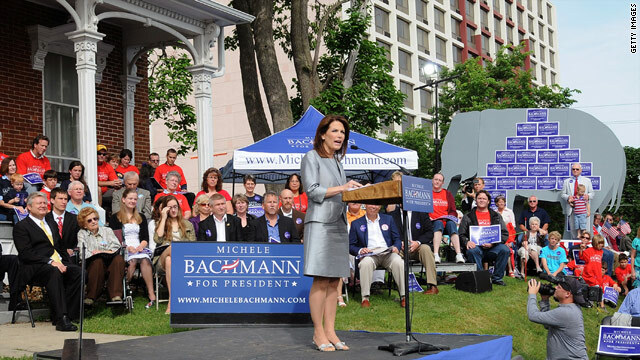 "The Bachmann campaign and congressional office I inherited were wildly out of control," Carey wrote. "If she is unable, or unwilling, to handle the basic duties of a campaign or congressional office, how could she possible manage the magnitude of the presidency?" Carey's comments in the Iowa paper came the day after Bachmann's official campaign announcement in her native Waterloo. Her former top adviser said he agrees with Bachmann and Pawlenty on most of the issues "but the similarities end here." "I know Tim Pawlenty very well. He is a family man filled with faith and conservative convictions proven in action. He will make a great president," Carey wrote. "I know Michele Bachmann very well. She is a faithful conservative with great oratory skills, but without any leadership experience or real results from her years in office. She is not prepared to assume the White House in 2013." Team Bachmann did not immediately respond to a request for comment, but in an interview Tuesday Bachmann said she expects the negative stories. "There will be a media onslaught on attack, but that's nothing new," she said on NBC's "Today." "That is something that goes with the territory. It doesn't matter who the candidate is, whether they're male or female, there's simply attacks that will come." If you expect our Immigrants to understand our history, then, why not politicians who run for President of the United States. The excuse provided for Bachman's gaffe is unsatisfactory. Know your history, otherwise, go back to your profession, "lawyer". "Cornelis de Jager, a solar physicist from the Netherlands and former secretary-general of the International Astronomical Union, announced that the sun is about to enter a period of extremely low sunspot activity, which historically is associated with cooling trends." lol...democrats wrong again! Democrats are always wrong(see: Barack Obama). Man, you'd think they would get discouraged, sit down and lower their voice but they keep coming back with their next wrong idea. Lady, if the criticisms are correct like this one, I don't see any issue with it. Fair enough. But if the criticisms like the ones you do irrespecfully against President Obama are baseless with conspiracy theories, then, That's not fair enough. It's totally unacceptable. Pawlenty and I agree on just about nothing. To his credit he is more than a child playing in an adult world. Can she even count on the woman vote? Because non of my female friends will vote for her. On the other hand, she does know enough about getting as many farm subsidies as possible from the federal government while criticizing it for wasteful spending to pacify her Teabag supporters. Cool for her!